Son of a sea cook, I did not get a chance to weigh in until now on the Web log. And I have so many questions to answer! It is a beautiful world when people ask questions for you to answer on your Web log, I will say that. Number one question, for everyone clamoring to hear Leonard Pennario playing the blues, click here and you will get the link. You can hit "play" and listen, or else download it so you can play it in perpetuity for yourself and your children and your children's children. Pennario plays "The Girl With the Flaxen Hair" and then he played the "Drum Boogie." In between there is one of my favorite radio quotes from all time: "Well, fluff my hair and call me Stokowski." Ha, ha! 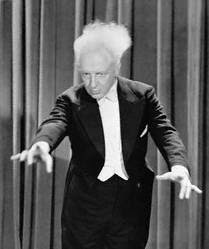 That is a picture of Leopold Stokowski and here is another. He does have fluffy hair! Also on the show there is a funny treatise from Leonard about how you play blues, eight to the bar. So cute. He was such a kick. That is a picture of him up above that ran in the magazine The Etude when he was in the army. I used to love to get him talking about that. He would tell me stories and I would just sit there and laugh. I actually like to listen to the whole show because after Leonard they have the Noel Coward song "I'll See You Again" which I love, and then the show ends with "Old Man River." That was great, when radio shows were like that! So that is one question. There is the question about Howard taping me when we first met. How that happened was, when Howard and I met, we had both gone independently to Fanny's to hear Al Tinney who was this old jazz pianist we both liked. Howard was working on his jazz piano playing so he was taping Al. Then I came up and sat down and started yakking, starting with when he asked me what song that was and I replied "Sophisticated Lady." Howard always teases me that in an instant, all his future taping of Al was ruined. Because ever after there I was, gabbing. Al Tinney was a wonderful pianist though I have to admit he could not turn out the barrelhouse blues the way Pennario could, I can see that now. One footnote about the tape of Howard's and my first conversation: He was afraid to tell me it existed for something like two years. He was afraid I would think he was some kind of loon! 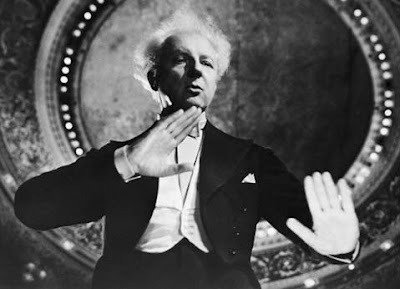 Stokowski and old radio: Fred Allen's Senator Claghorn was on a rant once about great musicians from the South and he mentioned Robert E. Leopold Stokowski...a great joke written by Fred Allen himself. Claghorn also named a favorite composition: Poet and Sharecropper. Way to go, Howard. And I thought I kept meticulous records! Pennario was just delightful to listen to in that 1947 show, 'Kraft Music Hall'. It was awesome to hear his voice and discover a bit about his lovely personality. Now, I love him even more. He was such a very wonderful artist and person! Last night, I listened to him playing Rach 3 with a new perspective. Yes, Mary, that was an outstanding remark Leonard made, LOL! He made several good ones and I really enjoyed it so much. Thank you! The best part, and Mary has not mentioned this yet, is that I surprised her, on the 2nd anniversary of our dating, with a CD. The CD was the recording of our first conversation. It was about an hour long, too.